Pay attention. Listen. Be inclusive. Don’t gossip. Show respect. Be agreeable. Apologize. Give constructive criticism. Take responsibility. Most of us learned these basic rules of discussion back in grade school. Yet, how often does anyone really abide by them anymore? While civil discussion is an age-old concept and a core principle of democratic societies, one needs only to turn on a TV or listen to, gulp, talk radio to see that reasoned and respectful conversation is on the decline. Tom Grogan, leader of the Oshkosh Civility Project, believes society can reclaim some intellectual and cultural territory lost to polemicists and pundits alike by incorporating these nine basic rules of civil communication into everyday life. Grogan emphasizes that practicing civility is necessary for us to foster healthy debate, empathize with each other, and work through cultural issues. “We make stronger communities by having a shared understanding of the principles of interpersonal communication,” he says. Along with Oshkosh Civility Project co-founders Walter Scott and Karlene Grabner, Grogan facilitates civility discussions at area public schools, businesses, faith communities, and on campus at the University of Wisconsin–Oshkosh, where he is Special Assistant to the Chancellor. Since the Oshkosh Civility Project began in 2011, over nine hundred community members have signed a pledge to adopt the rules of civil discussion and work to enhance their communication and compassion skills. Grogan says the Oshkosh Civility Project’s model is derived from a public service campaign by the Duluth Superior Area Community Foundation called “Speak Your Peace.” Drawing on the 2002 book Choosing Civility: The Twenty-five Rules of Considerate Conduct by Dr. P.M. Forni of the Johns Hopkins University, the Duluth Superior Area Community Foundation launched “Speak Your Peace” in 2003 as an attempt to address the hurtful effects of divisive, uncivil communication in its own community as well as the country at large. Today the “Speak Your Peace” model is being used in Oshkosh, Door County, and Appleton as well as more distant places—Truckee, California; Montgomery County, New York; and Bowling Green Township, Ohio—to address bullying, hate speech, and other modes of communication that erode democracy. 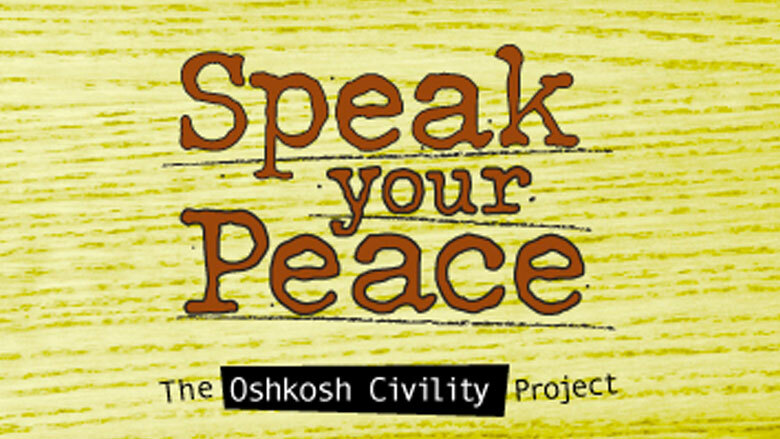 Grogan’s Oshkosh Civility Project has used a version of the “Speak Your Peace” model for well-received presentations in Waukesha, Fond du Lac, Green Bay, and Madison, and he and his colleagues have provided direct guidance to Door County and Bowling Green Township in promoting their own civility pledges. Grogan points out that this civility model resonates with so many people in part because citizens are tired of the decidedly abrasive nature of much of today’s public dialogue, especially in the arena of politics. Grogan recently launched a networking site called The Wisconsin Civility Project to connect the different civility efforts around the state and country. If you are interested in starting a civility pledge or advocating the nine rules of civil communication in your neighborhood, organization, school, or business, visit wisconsincivilityproject.org for more information.